Here’s the good thing about CNA training: The basics are the same no matter where you go. While you’d have to get re-certified if you moved to a different state, it wouldn’t take too much training to do so. So if you work in Colorado for a while and then move to another state, the training you take with you can still help you get a job elsewhere. But why would you leave? Colorado is an excellent place to live! Yes, it’s getting more expensive to live here, but there’s so much to do and see. Are you interested in job security once you get your CNA certification in Colorado? Of course you are, and we’re here to tell you that your skills will be in demand for a very long time in our fine state. While you might see new businesses and houses going up everywhere you go, you might not know just how Colorado compares to the rest of the nation. Colorado is the second-fastest growing state in the United States (seventh-fastest in the last year), growing by about 20% in just 19 years. From 2000 up to now, more than 1.5 million people have moved to (or been born in) Colorado. The secret is out; Colorado is an amazing place to live. As more people move to Colorado, they’re going to need health care. A greater population means that people of all ages are going to need people certified with CPR training and first aid certificates. It also means that retirees are going to need more people with CNA training. Look around anywhere you go and you’ll see daycare centers going up. As more people — especially young people — move to Colorado, they are having more babies. That not only means that more nurses will be needed at hospitals and pediatrician offices, but it also means that more daycare center employees will need infant CPR training. Colorado has always been a destination for those who like to “get out and do something.” Camping, hiking, horseback riding, and hunting have all been bringing people to our state for decades. Many other sports have been added over the years, ones that require little or no training before people partake in them: skiing and whitewater rafting come to mind. As more businesses offer these fun-filled (yet slightly dangerous) activities, they like to use their employees’ CPR certification and first aid training. They’re more likely to bring in customers if customers know that they’re going to be safer during the adventure. If you take a look at the Colorado population chart, there’s a sharp uptick right around 1950. This was, of course, the start of the baby boomers. Colorado certainly isn’t special in this regard, as similar population growth occurred in every state. But that still means that these baby boomers are going to need care; they’ll need more people with CNA training to help them. Speaking of baby boomers, there are quite a few reasons why Colorado is such a nice place for people to retire. Retirement Cities – There are many cities in Colorado that often make the “Best Cities To Retire To” lists. While cities like Fort Collins might often be identified as being younger towns (since it’s a college town), it also has many amenities that retirees enjoy. Mountain Homes – Many people who have vacationed in Colorado have always dreamed of moving here and buying the mountain home they’re always wanted. Colorado’s foothills allow them to have that mountain home while still being close to amenities. Colorado Offers Open Spaces – For those who really want to get away from it all, there are still open spaces in Colorado where recluses can start up that hobby ranch they’ve always wanted. We Have New Hospitals – As people age, their criteria for where they want to live leans toward finding reliable hospitals. Because Colorado’s population is growing, we’re seeing some top-notch hospitals going up. As retirees are drawn to Colorado for the reasons above, they bring with them the need for nursing homes and CNA-trained individuals just a few years later. 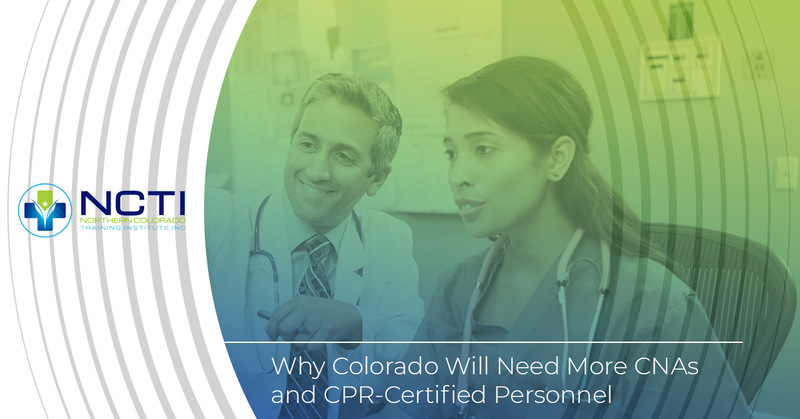 We know what you’re thinking: If Colorado is so healthy, then why will it need more people with certified nursing assistant training? Here’s the logic. When people are unhealthy, they tend to die younger. They might die from a heart attack or stroke at an earlier age, and that often happens very quickly. The never end up needing CNA-trained people to help. On the other hand, people who are healthier tend to live longer. If they don’t die young, they have many more decades during which they’ll need an increasing amount of care. Those extra years of life mean that they’re around longer and will be in need of those with CNA certification and Heartsaver CPR training. Are You Interested In CNA Training In Colorado? Colorado is an excellent state in which to get your CNA certificate, as well as many other types of schooling such as first aid training, CPR classes, and BLS certification. If you become a CNA, you can use that as a way to become a nurse or you can simply enjoy the job security that comes with the advantages of the population growth in Colorado. If you’re ready to take the next step in your career, Northern Colorado Training Institute is ready to train you at our Northglenn or Loveland offices. Find out more about them here!